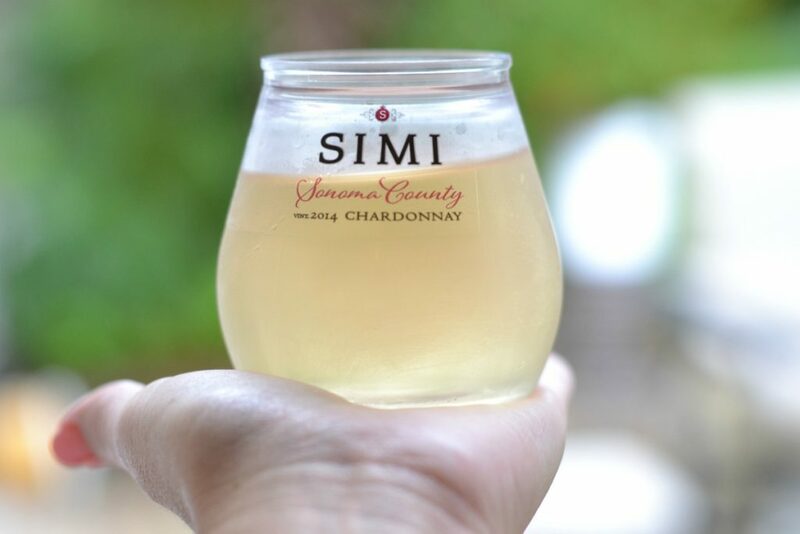 I don’t often come across new products that make me want to shout from the rooftops: “Where has this been all my life?” The new stacked wine from Simi, however, is worth the shout out. You might already know this about me, but if not, you will now: I love wine. And I also love partaking in fun outdoor activities where wine is allowed — block parties, neighborhood pool parties, a picnic on the beach, picnics in general, music on the lawn, our annual neighborhood Halloween parade, and tailgating. I’d even consider glamping (with a strong emphasis on the GLAM) if wine was involved. There’s nothing better than being outside with friends on a beautiful evening, and sipping a cool glass of chardonnay. Yet, I’ve always struggled with HOW to take my favorite beverage “on the go.” Typically, glass is forbidden in public arenas that allow alcohol, which means I’ve been forced to rely on some sort of thermos and red cup combo. If you are a little bit of a wine snob like me, you know wine is just not the same when it’s not in a pretty cup, and it just feels wrong to pour nice wine into a thermos. I know…the struggle is real. I’ve been waiting for the day when I could find a high quality wine in a convenient type of packaging. So when I saw these stacked wines from Simi, I knew my dilemma had been forever solved! 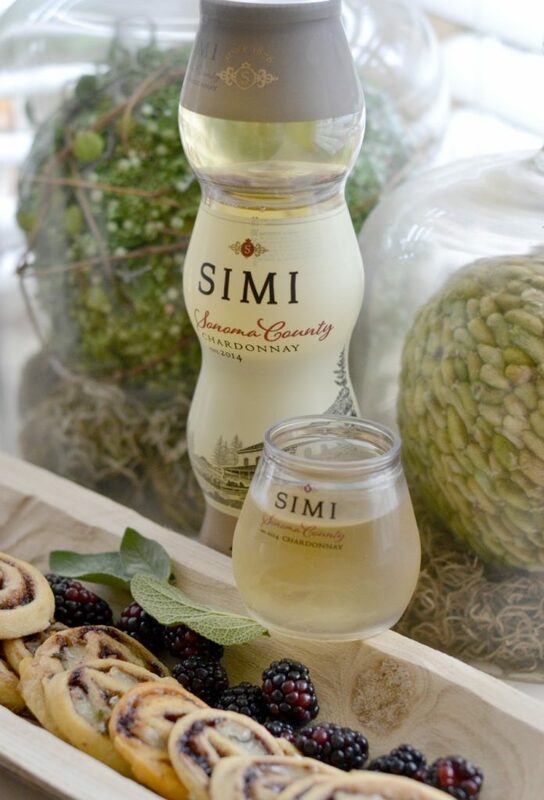 Each stack contains a 4-pack of Simi chardonnay in cylindrical, clear, strong plastic cups, stacked on top of each other. The four wines are sealed individually, so you can toss one or two in your cooler, or pack up the whole stack. Even if you’re not a wine drinker, these would be great to stock in your house for guests. The single servings mean that you don’t need to open a whole bottle for someone who might only drink one glass, and you’ll always be prepared for last-minute entertaining. A) portable, so that I could easily pack it up and take it on the road with my portable wine. 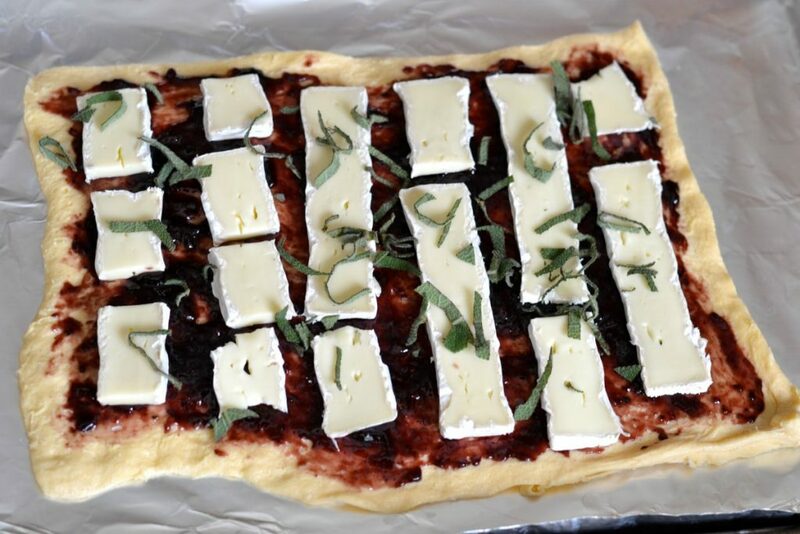 C) featuring brie and blackberries — two of my favorite ingredients to pair with wine. 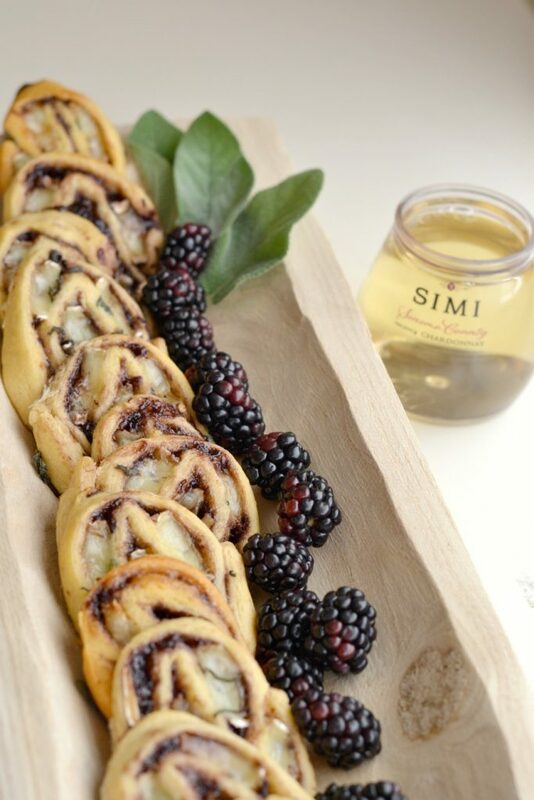 Brie, Blackberry Jam & Sage Pinwheels were born. These pinwheels look sort of fancy, but they were VERY easy to make, and you only need four ingredients: crescent dough, blackberry jam, brie, and sage. Spread out the ingredients, roll it all up, slice it up, bake it, and you’re done! And the pinwheels don’t need to be served hot out of the oven…they are just as good at room temperature, and can be easily packed up to go when they’ve cooled. 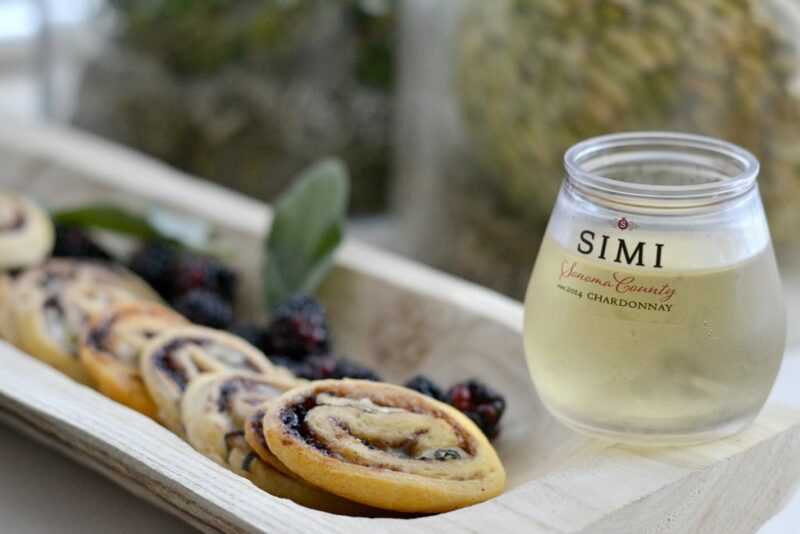 The flavors of the brie, sage, and blackberry go so well together, and when paired with the stacked Simi chardonnay, it makes for a killer combination. And be sure to visit the EntertainAndPair Social Hub to get more ideas for enjoying stacked wine, as well as some additional pairing ideas. PS: Not only is stacked wine a perfect gift to give YOURSELF, but it makes a fantastic gift for OTHERS, TOO. Do you have a friend who could use a smile? Know somebody new to the neighborhood? Want to thank someone who did something kind? Giving wine as a gift is nothing new, but giving stacked wine as a gift adds a fun little twist. I have lots of ideas for how you can gift and wrap the stacked wine. 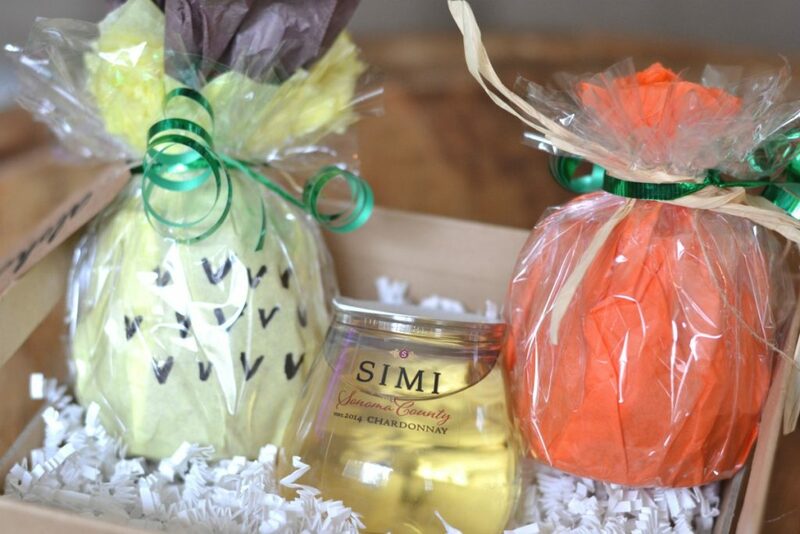 I’ve written up a wine wrapping tutorial, which shows step by step wrapping ideas for stacked wine, and also offers suggestions for fun gift baskets to put together for a hostess gift, welcome gift, thank you gift, or any occasion gift. Thanks, Kelly! The pinwheels are so easy…they are going to be my “go to” for parties from now on.